Oprah Winfrey or Jesus: Who’s right? Oprah Winfrey said it. And when she did, many Americans who love Oprah believed it. But one of the best-selling living evangelical authors, Josh McDowell, is not about to sit back and let that statement go unchallenged. The result is a very unusual book – both in Christian publishing and in the world of secular literature. Get your autographed copy of “O God” exclusively from the team that published it – WND Books and the WND Superstore. It’s called “O God: A Dialogue on Truth and Oprah’s Spirituality” – and its official debut in bookstores nationwide comes tomorrow. “As Christian apologists who believe that salvation is by God’s grace alone, through faith alone, and in Christ alone, we wanted to create a fictional, almost Socratic dialogue that would cover many of the themes of Oprah Winfrey’s spiritual teaching in recent years,” explain McDowell and co-author Dave Sterrett in their preface. Rather than pile on Oprah with Bible verses to contradict her casual New Age proclamations, McDowell and Sterrett use a fictional conversation – or series of conversations – between two female graduate students, both seeking spiritual truth. The book comes out as Oprah is very much center stage in the news world. Even in her bid with first lady Michelle Obama to land the Olympics in Chicago, her rhetoric took a markedly spiritual tone. Oprah is also lending her name to a new movie about abusive relationships called “Push,” for which she serves as executive producer. “Push” is about an abused, obese teenager in Harlem who is pregnant with her second child and how a teacher at an alternative school tries to pull her out of her situation. Winfrey was inspired by the message of hope that the book and film present. It is Oprah’s compassion that lures millions to her TV show and her magazine and the persona that has become an industry. Yet, McDowell and Sterrett explore the possibility that misguided compassion, based on human emotions rather than divine revelation and God’s law, can lead people in dangerous directions. McDowell has authored or co-authored more than 110 books with more than 35 million in print worldwide. His classic “More Than a Carpenter” alone sold more than 15 million copies. 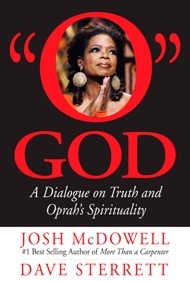 Get your autographed copy of “O God: A Dialogue on Truth and Oprah’s Spirituality” by No. 1 bestselling author Josh McDowell and Dave Sterrett exclusively at the WND Superstore.